5 guys, 4 legends, 3 lovers, 2 friends, 1 band. A reconstruction of the legendary British rock group's early days, before the advent of Beatlemania and world-wide fame. The story focuses on the turbulent and exciting period that the Beatles' spent in Hamburg, Germany in 1960-62, when they played in a series of rough-and-tumble dives and came into contact with cutting-edge artists. Among them was photographer Astrid Kirchherr, who helped shape the group's image, and with whom both John Lennon and former Beatle Stu Sutcliffe fell in love. Ultimately, Sutcliffe left the group, making way for the success of one of the greatest phenomena in rock music history. Ever since the band became famous, folks have argued over who deserved the title of “The Fifth Beatle”. Radio DJ Murray the K popularized the concept and touted himself in the role, but if anyone deserves the claim, it’s probably Stuart Sutcliffe. The band’s original bass player, he’s the only member to actually quit the Beatles; drummer Pete Best occasionally goes for the “Fifth Beatle” moniker, but he was fired and replaced with Ringo Starr. Undoubtedly the musically untalented Sutcliffe would have been booted from the band as they rose to prominence, but he decided to pursue his artistic talents instead. Sutcliffe’s story is at the core of 1993’s Backbeat, a look at his tale as well as that of the early Beatles. Backbeat starts in Liverpool circa 1960 and immediately sets up the close friendship between Sutcliffe (Stephen Dorff) and John Lennon (Ian Hart). Sutcliffe paints but gets nudged into music by Lennon, and Stu winds up as the bass player in Lennon’s band. That pair and fellow Beatles Paul McCartney (Gary Bakewell), George Harrison (Chris O’Neill) and Pete Best (Scot Williams) head to Hamburg to ply their trade in the local clubs. The band takes up residency at the Kaiser Keller, where they work long hours but enjoy perks like close relations with the strippers. Eventually they meet local artist Klaus Vorrmann (Kai Wiesinger), and he introduces them to photographer Astrid Kirchherr (Sheryl Lee). She and Stu immediately fall for each other, which provokes jealousy from the possessive Lennon. Nonetheless, she photographs the band, and she and Sutcliffe develop a close relationship. Tensions develop between McCartney and Lennon over Sutcliffe’s lack of musical talent. Paul thinks Stu’s holding them back, but Lennon’s loyalty forces him to stand up for his pal. However, Sutcliffe’s infatuation with Astrid leads him to stray from the band, and issues come to a head when they get a chance to record for Polydor Records. The movie follows their divergent paths and also problems that develop when Sutcliffe gets ill. The main problem with Beatle-related films is that so many of us already know so much about the topic. How do you provide a fresh take on a topic that’s been obsessively dissected for 40 years? It’s not easy, and for fans, we wonder what we can get from this sort of project. In my opinion, not much. As with The Two of Us - a fictionalized account of some time Lennon and McCartney spent together in the mid-Seventies - Backbeat wants to get us inside the minds and lives of these exceedingly well-known people. As with Two of Us, it stays with surface notions of the characters and never digs into them deeply. The thin characterizations remain the biggest flaw of the movie. Sutcliffe stands as the main participant, I suppose, though we see a lot of Lennon as well. The movie uses the easy concept of John and concentrates almost solely on his bitterness. Lennon’s one Angry Young Man, which leaves little room for charm or magnetism. It becomes tough to figure out why anyone puts up with his nonsense, as he’s consistently cruel and nasty. At least this gives his some form of personality, which is more than I can say for Dorff’s take on Sutcliffe. Since he died before the Beatles became big, Stu never stood in the public eye. The movie could have provided insight into this influential cohort but instead, Sutcliffe is a virtual non-entity. Stu offers almost a blank slate. He shows no character and is totally forgettable. Similar thoughts greet Lee’s take on Kirchherr. The real Astrid cooperated in the production, and that’s easy to tell since it treats her in such a uniformly positive light. She’s viewed as wonderful, sophisticated and always helpful as she opens up a new world to Stu. Kirchherr becomes little more than a pretty symbol and never threatens to turn into a real character. With less screentime, the other Beatles get even worse exposition. They’re presented as thin caricatures. Paul just cares about getting ahead, and he’s portrayed as self-absorbed and manipulative. George comes across as a timid mama’s boy, while Pete Best is a vaguely surly non-entity. As usual, Paul is the one who gets the worst treatment, for the movie makes him look like a preening jerk. Like many Beatle-related projects, Backbeat also minimizes the influence of any member other than John. Paul, George and Pete essentially function as Lennon’s flunkies. He runs the show and the others seem to have little influence or impact on things. I hate this one-sided take on the situation; it’s a myth that’s developed over the years, and it has no place here. At least most of the actors pull off their accents fairly well. Dorff struggles with his and never manages it in a convincing way. Of course, it doesn’t help that we have to contrast Dorff with real Liverpudlian Hart; it’s no surprise his Lennon sounds believable since he’s the real deal. That brings up one major issue in Backbeat: suspending disbelief. Whenever an actor plays a really famous personality, their work needs to balance mimicry and interpretation. We don’t want to see the actors just blindly impersonate the inspirations, but they need to create the illusion to make us buy them in the part. The more famous the person in question, the more delicate a balance this becomes. That’s not a problem for Dorff or Lee, but all the guys who play the Beatles run into that problem. Because they stick with the one-dimensional elements of the characters, we generally accept them during the dramatic scenes. The concerns come from the music. As director Iain Softley states during the commentary, the movie uses a “grunge supergroup” and their work doesn’t attempt to mimic the Beatles’ sound. They tried for the spirit instead, and that’s not a bad idea. It just doesn’t work. Again, because so many of us are so familiar with the voices of the singers, it becomes a distraction when the provided singing doesn’t match our concepts. None of the performers sounds much like the real thing. This takes us out of the moment and makes it hard for us to accept the performers as the Beatles. In addition, the bass playing is far too competent. Through the movie, we constantly are told of Sutcliffe’s inadequacy as a bassist, but you won’t get that impression from the recorded material. Occasionally we hear intentional goofs, mostly when Stu gets ill and can’t function. Otherwise, his work sounds perfectly fine. That means that the scenes in which Paul and John fight over Sutcliffe’s place in the band make little sense. 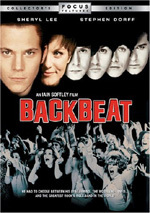 In addition to the lack of depth accorded the characters, Backbeat suffers from other issues. For one, it lacks a consistent focus. It never quite decides if it wants to concentrate on the Beatles’ early days or if it wants to deal with the life and love of Sutcliffe. The latter subject gets most of the screentime, but it never quite takes firm prominence. We find just enough of the Beatles’ story to intrigue us, but instead, sappy melodrama connected to Stu and Astrid is the main focus. And that’s why Backbeat is a turgid drag. Clearly there’s a great story here, as the Beatles’ time in Hamburg was pivotal in their development. Unfortunately, the film prefers to go the melodramatic route as it shows the conflicts of its one-dimensional characters. It feels more like a TV movie than anything else. 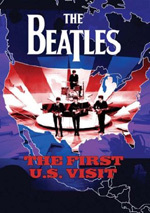 Footnote: don’t expect any real Beatle music here, though that’s appropriate, since the program focuses on the period in which they mostly played covers. Backbeat does use songs the band commonly performed, and even though the majority of the numbers come from re-recordings, we do hear the real Beatles at one point. The scene in the studio with Tony Sheridan uses the actual recording. 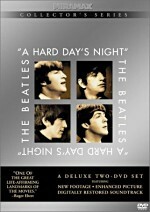 Backbeat appears in an aspect ratio of approximately 1.85:1 on this single-sided, double-layered DVD; the image has been enhanced for 16X9 televisions. Were it not for some prominent edge enhancement, this would be an “A”-level transfer. Really, the haloes created the only significant distraction during the movie. I noticed edge enhancement most of the time. While the haloes never became overwhelming, they framed many elements and detracted from the presentation. A little shimmering also occurred, along with a few minor examples of jagged edges. As for sharpness, it was quite good despite the edge enhancement. The movie consistently looked nicely detailed and delineated. To my surprise, I found no source flaws. Given the movie’s age and budget, I expected at least a few marks, but none appeared in this clean presentation. Colors always looked very nice. The movie stayed with a natural palette and the DVD replicated the tones accurately and vividly. Some of the shots in Hamburg presented opportunities for lively colors, and the DVD used those to their best advantage. Blacks were deep and firm, and low-light shots demonstrated fine detail and clarity. Despite the edge enhancement, I thought the film offered a fine visual presentation. Unfortunately, I felt much less impressed by the Dolby Digital 5.1 soundtrack of Backbeat. The soundfield remained restricted most of the time, which didn’t come as a surprise given the film’s dramatic bent. Songs played a large role and demonstrated decent stereo imaging, though matters could be somewhat mushy at times. Other than the music, the soundfield stayed mainly with general ambience. There wasn’t a lot of action in the movie. The surrounds contributed minor reinforcement of the music and that was about it. I noticed very little activity from the rear speakers. I didn’t mind the lackluster soundfield, as it seemed logical for this kind of drama. Backbeat lost points due to the problematic execution of the audio. Music was all over the place. Occasionally the songs sounded natural and true, but more often they were too bright and lacked low-end material. Oddly, the volume level fluctuated wildly for the various tunes. Sometimes they got stuck into the background, while other scenes featured them in a much louder manner. This didn’t seem connected to the film’s story or action, as volume level sometimes varied noticeably during the same tune. Outside of the music, audio quality was fine. Speech sounded clear and crisp, with no edginess or other concerns. Effects played a small role but those elements were accurate and acceptably well-rendered. This was a movie closely connected to music, however, so those flaws and the general lack of ambition led me to give the audio a “C”. For this “Collector’s Edition” of Backbeat, we get a decent roster of extras. We start with an audio commentary with director Iain Softley plus actors Ian Hart and Stephen Dorff. This piece consists of two separate running, screen-specific tracks that get edited together; Softley and Hart sit for one, while Dorff completes the other. Oddly, the DVD’s packaging fails to mention this commentary. That doesn’t connote it’s bad piece; it suffers from a few flaws but usually presents a good conversation. We hear about the project’s genesis and slow path to the screen, the balance of history and dramatic license, casting and bringing the characters to life, shooting on location, recreating the music, visual elements and cinematographic techniques, and cut sequences. The main problem stems from too much dead air, as the participants go silent too often. However, they speak most of the time, and when they talk, they offer quite a few good notes. It’s a generally useful and informative commentary. Next we find A Conversation with Astrid Kirchherr. In this seven-minute and 15-second chat, she discusses Sutcliffe, meeting him, her photography, and his art. We don’t see modern shots of Kirchherr; instead, the program shows movie clips, her pictures and some of Sutcliffe’s art. The focus remains very basic here and we don’t learn much from her memories. Two deleted scenes appear on the disc. We get “A Frosty Sense of Humor” and “Perfect Fit”. Together, the pair last a mere two minutes, 58 seconds. In the first, Stu tells Astrid a joke against her protests, while the second gives us another love scene between the pair. Neither adds much to the experience. More information from the director comes in an Iain Softley Interview for the Sundance Channel. It runs 28 minutes and 28 seconds as he covers his inspirations to make the movie, the film’s focus and storytelling choices, casting and the actors’ work, the music, reactions to the flick, and general impressions of making the piece. Surprisingly, not a lot of information repeats from the commentary, as Softley goes over quite a few new tidbits. It’s a tight and interesting piece with nice insights into the movie. I especially like the tale about Paul McCartney’s negative reaction to the flick and Softley’s explanation for a scene that bothered the ex-Beatle. Additional chatting shows up in an Interview with Iain Softley and Ian Hart. During the nine-minute and 58-second clip, we get notes about the movie’s origins, the bonding between the actors, the music, the movie’s distribution, shooting on location, and some favorite scenes. Unlike the Sundance interview, this one does reiterate more than a little information from elsewhere. Most of the new elements come from Hart, but we also find intriguing bits like Softley’s discussion of the movie’s rough road to the big screen. It’s a decent featurette but a little redundant at times. A TV Featurette fills 11 minutes and 58 seconds. It includes movie shots, behind the scenes bits, and soundbites. We hear from Softley, Hart, actors Stephen Dorff, Tony Bakewell, Sheryl Lee, Scot Williams and Chris O’Neill. They cover a little of the Sutcliffe-related history, the movie’s story, casting and approaching the characters, and the music. A couple of interesting elements pop up, but mostly this exists as a promotional piece, and movie clips dominate. The Casting Session goes for six minutes, 40 seconds. We see auditions for Dorff, Bakewell, and Wolf Kahler. We also see the actors who played the Beatles play as a band minus Dorff. That’s the most compelling of the clips, largely because it includes real singing and playing for some parts. Softley pops up again for the Director’s Essay. This text piece covers the same subjects found elsewhere: the project’s origins and path to the screen, casting, the music, and reactions to the flick. A few additional details pop up, but don’t expect much fresh material. Finally, we get a Photo Gallery with 19 stills. These mostly offer shots from the film as well as a few behind the scenes snaps. There’s nothing special here, though I like the presentation, as it includes helpful captions. A major disappointment, Backbeat fails to bring the story of the early Beatles to life. It features simplistic characters and a focus on cheap emotion that take it into the category of bland melodrama. The DVD presents surprisingly good picture with erratic audio and a reasonably useful batch of extras. I wanted to – and expected to – like Backbeat, but I thought it offered an unsatisfying take on its subject.